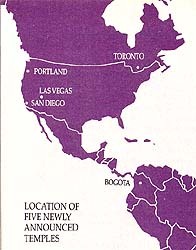 At a Saturday morning meeting preceding the first session of the Church’s 154th Annual General Conference, President Gordon B. Hinckley, Second Counselor in the First Presidency, announced plans for construction of five new temples﻿—three in the United States, one in Canada, and one in Colombia. The temples will be built in San Diego, California; Portland, Oregon; Las Vegas, Nevada; Toronto, Ontario, Canada; and Bogota, Colombia. Members of the Council of the Twelve, Regional Representatives, and stake presidents from the areas involved were invited to the meeting for the announcement. Regional Representatives from the new temple areas expressed gratitude for the blessings the sacred edifices will offer to the members in the temple districts. The announcement brings to forty-seven the number of latter-day temples operating, under construction, or in planning stages. No information was yet available on the sites for the new temples within their communities, but President Hinckley indicated that Church representatives will work closely with local government and community leaders to ensure that the edifices are assets to their areas. He prefaced the announcement of the temples by commenting that to “every faithful Latter-day Saint, a temple occupies a position of special affection and offers special blessings that can be obtained in no other place. Temples, and that which occurs within them, are the very essence of the gospel of Jesus Christ. The work that goes on in these sacred houses is, for the most part, concerned with eternity, and the things of eternity. And the great selfless labors carried on by the Saints wherever these Houses of the Lord are found represent, in my judgment, more nearly the spirit of the Son of God, who gave his life as a vicarious sacrifice for all of us, than any other work which I know. “We are living now in a great temple-building era of the Church,” he continued, noting that six temples were dedicated in 1983, six are scheduled for dedication this year, and six more are scheduled for completion and dedication in 1985. “This will mean that within a period of three years we will have dedicated as many temples as were built and dedicated in all the previous history of the Church. “To carry on the great mandate given by President Spencer W. Kimball, we go forward with this work of taking the temples to the people of the Church, building smaller temples, and more of them, so that the Latter-day Saints will not have to travel so far to take advantage of the great blessings offered in these Houses of the Lord,” he commented. President Hinckley explained that there will be opportunity for financial sacrifice by members in the areas affected, for while the major portion of building costs will come from the general funds of the Church, “it will be necessary for those who will be beneficiaries of these temples” to contribute toward their construction. Then he invited Regional Representatives from communities where the temples will be located to respond. He spoke of the great blessings that will come not only to active members, but also to the inactive and nonmembers as they prepare themselves for the temple or are attracted to the Church by the spirit they feel in the community as the temple fills a visible place there. Then, on behalf of Saints in his area, he expressed gratitude to Church leaders for their confidence in the members and pledged their “total commitment,” not only financially, but spiritually as well. The new San Diego temple will serve more than fifty thousand members in the greater San Diego area; the Yuma, Arizona, area; and the Mexicali and Tijuana, Mexico, areas. Ronald Swapp Jolley, a Regional Representative from the Portland area, spoke for Church leaders and members there when he said, “We’re humble, we’re grateful, and we pledge our loyalty, and our faith, and our sacrifice to this great endeavor. “The fires of faith in the Portland, Oregon, area burn brightly, and I’m sure as the temple is erected, we will have tremendous response. We have a temple-going people. We look forward to that time when we can enter the house of the Lord there and perform those soul-saving ordinances,” he said. The Portland Temple will serve more than eighty-two thousand members in Oregon and the southwest corner of Washington state. The Las Vegas Temple will serve more than forty-three thousand Saints. Bryant W. Rossiter, a Regional Representative from the Toronto area, noted that he spoke not just for himself, but for “eight wonderful stake presidents” from eastern Canada who were attending the meeting, as well as for members at home who would soon hear the news. “I can tell you with all my heart that they will rejoice in this announcement, and I can tell you also that they will support the activities that will be necessary to fulfill the purpose of establishing a temple in Toronto. It will bring great unity, I think, among the Canadian people in eastern Canada.” That unity will come not only in terms of temple work, but also in other spiritual activities, he affirmed. The Toronto Temple will serve approximately fifty-six thousand members in the Toronto, Quebec, Halifax, and Montreal areas of Canada, as well as in northern Vermont, New York, and Ohio, and eastern Michigan. “I am still trembling with emotion from listening to the announcement of a temple in Bogota,” said Alejandro Portal, a Regional Representative from Colombia, speaking through an interpreter. “I have been trying to speak English all of the time that I have been here in Salt Lake City, but now I do not even have the words in Spanish” to respond. He voiced gratitude “to our Heavenly Father and to the authorities of the Church” for their confidence in the Saints in the proposed temple district. Speaking in behalf of the Colombians and Venezuelans who will use the temple, Brother Portal promised, “We are ready to put all our heart into this work. I have a great testimony of the Church. It is my life. And I am prepared to go forth,” he concluded. The Bogota Temple will serve some fifty-five thousand members in Colombia and Venezuela. Then he invited President Ezra Taft Benson of the Council of the Twelve to comment on behalf of that quorum. “I’ve never forgotten it. That’s our hope with our family today,” he said. “I can’t think of anything that will bring greater increase in spirituality, and greater gratitude to people, than to have a temple where they can go and have these sacred ordinances performed, not only for this life, but for eternity. “I thank the Lord on behalf of my brethren of the Twelve﻿—all of whom support wholeheartedly this great increase, under the inspiration of President Kimball, in temple building. May God bless us as we move forward in this great and eternal program,” President Benson said. The new temples in San Diego, Portland, and Las Vegas will bring the number of temples in the United States to twenty-two. Temples are now operating or are under construction in Utah (seven), California (two), Idaho (two), Hawaii, Washington state, Arizona, Colorado, Illinois, Texas, Georgia, and the Washington, D.C., area (Maryland). The Toronto Temple will be the second temple in Canada. The other Canadian temple is located at Calgary, Alberta. In addition to the Bogota Temple, there are five others in operation or under construction in South America: in Brazil, Argentina, Chile, Peru, and Ecuador.